Okay, time for the individual episode reviews! I will follow the same basic format as last year, with the recap first, my general opinions next, and then a few extra sections where I just geek out on various specific topics. I’ll try to not let the recaps go on too long, but I’ve decided that they’re worth having, just as a refresher on what happened. And, as you know, comments always welcome! It’s a very warm night in New York, and Daredevil is having what we can presume to be a pretty standard evening. Tonight he’s chasing down a band of masked and armed robbers, taking them out one by one. It’s a perfect way to start off the new season, showing us that Matt has now become used to his late night gig. He’s enjoying it too, flashing a gleeful grin while observing the cops finishing his work, at the end of the opening scene. 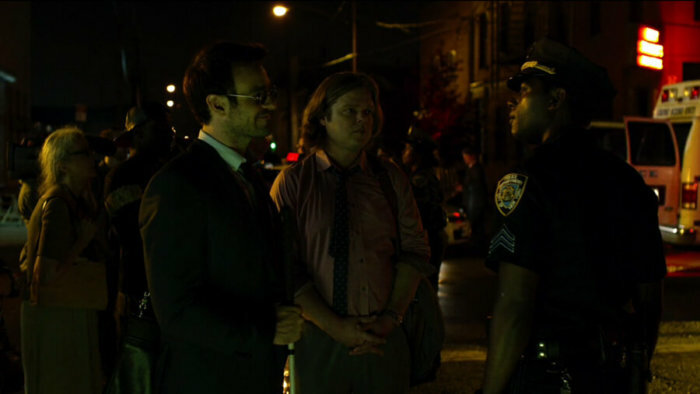 After the credits roll, we see Matt and Foggy walking to work, having a pleasant conversation about Foggy’s adventures on the dance floor when Foggy notices Matt bleeding and the conversation quickly turns to the issue of Matt being Daredevil and Foggy’s concerns. While the two have clearly gone back to being friends after the drama of last season, Foggy has not accepted what Matt does. Matt offers a defense in the form of a story about a client they had, whom Matt – as Daredevil – saved from a violent husband when the law wasn’t enough to protect her. Foggy takes it all in and makes him promise not to get hurt. When Matt and Foggy arrive at the office. Karen is there already with an office full of clients, whose cases she quickly sums up for the late arrivals. After the three of them step into Matt’s office, Karen tells Matt and Foggy that they’re broke. At this point, Matt shows a baffling lack of concern at hearing this news, figuring that it’ll work itself out. Next, we cut to a large group of Irish gangsters who are gathered in a club to celebrate and discuss their future. As their leader reminisces about the good old days, complains about the arrival of Wilson Fisk on the scene, and talks about the fortuitous arrival of “the devil”, their meeting comes to a violent end when shots are fired. Lots, and lots of them. The interior of the club now a war zone, a single survivor escapes. Meanwhile, the entire staff of Nelson and Murdock are enjoying themselves, drinking and playing pool at Josie’s. When Foggy goes to the restroom, Karen decides to help Matt out and as the two get close, her attraction to him is unmistakeable. While Karen goes to buy another round, Matt shows off a bit by sinking two balls, before his attention quickly turns to a man at the bar looking at them. Matt notices his rapid heartbeat, high adrenaline levels and the fact that he’s tapping his finger against the trigger of the gun in his pocket, and decides to approach. Next, we learn that the man’s name is Grotto and that he’s come to request their help. He wants to cut a deal with the D.A. and start fresh, but refuses to do anything without legal representation. Right before we cut to the next scene, Grotto collapses and Karen notices that he’s bleeding from the side of his torso. Matt and Foggy go to the scene Grotto just came from and seek out Brett. While Matt listens to what’s going on at the crime scene, Foggy lets it be known, in as subtle a way as he can manage, that they have recently acquired a client with information about the shooting. They agree to help each other, and Brett takes them aside to tell them that this isn’t the first crime of its kind. There is talk about a heavily armed paramilitary organization. Matt meanwhile overhears someone mention that the Dogs of Hell were hit the same way. Matt tells Foggy that he’s going to rattle a few cages based on what they know. Foggy is not happy about it, but promises to try a lead of his own to see what he can find out. At the hospital, Grotto wakes up to Karen at his side, posing as his wife. She’s come up with aliases for the two of them, and a complete backstory. Grotto remains unconvinced that he’s safe. Next, we catch Turk, who is out on parole, sell guns when Daredevil shows up to beat some useful information out of him. It leads to a location in the meat packing district. Daredevil thanks him by throwing the keys to his car in the water. Heck, you almost feel sorry for Turk. 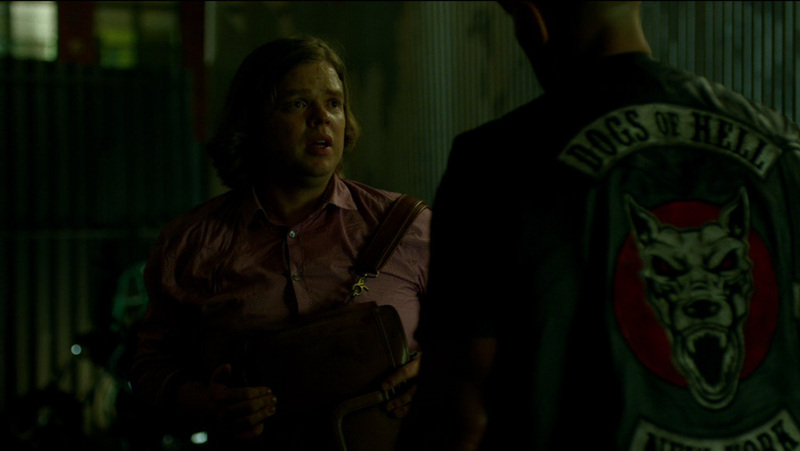 Foggy does some investigation on his own by going to the Dogs of Hell’s headquarters and asking for a guy named Smitty. Clearly out of his water, he comes up against some scary types who ask about his connection to Smitty, and Foggy reveals that they were in the third grade together, though obviously ended up taking different paths. Daredevil has found a slaughterhouse and when walking among the carcasses hanging from the ceiling, soon realizes that some of them are human bodies. Shortly thereafter, he hears the heartbeat of someone still alive and gets him down. 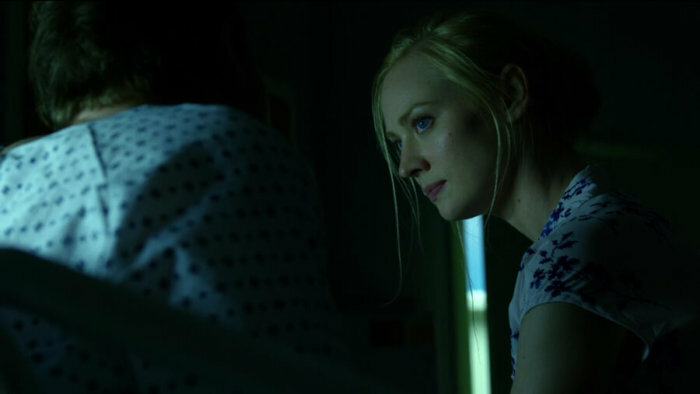 At this point, we’re back to Daredevil and the dying man he just unhooked from the ceiling. When Matt asks about the men responsible, he learns that this was done, not by a group of men, but by a single killer. In the scene that follows, that very same man is seen walking into the hospital where Grotto is resting up with Karen at his side. The shooter, whom everyone who hasn’t been living under a rock will know to be Frank Castle, has come to finish the job. When they realize they’re in danger, Karen grabs Grotto and the two start running with Castle right behind them. They get outside and into Karen’s car, with Castle still firing at the car as they escape. Just as Castle is about to take the shot that would kill Grotto, Daredevil attacks and the two trade blows. 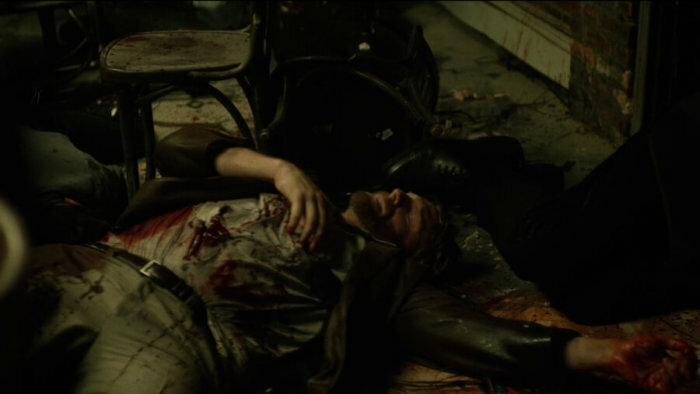 Daredevil gains the upper hand but Castle grabs his gun and shoots, and we watch Daredevil fall. “Bang,” indeed. Right from the beginning, I remember thinking that season two made season one look like a film school project. That’s not meant to slight the first season, which was exceptionally well received by almost everyone. It’s just that season two seemed to kick everything up a notch in ways that are evident right in the very first episode. It’s not just one thing. The pacing is better, the dialogue is better, the visuals are even more stunning. 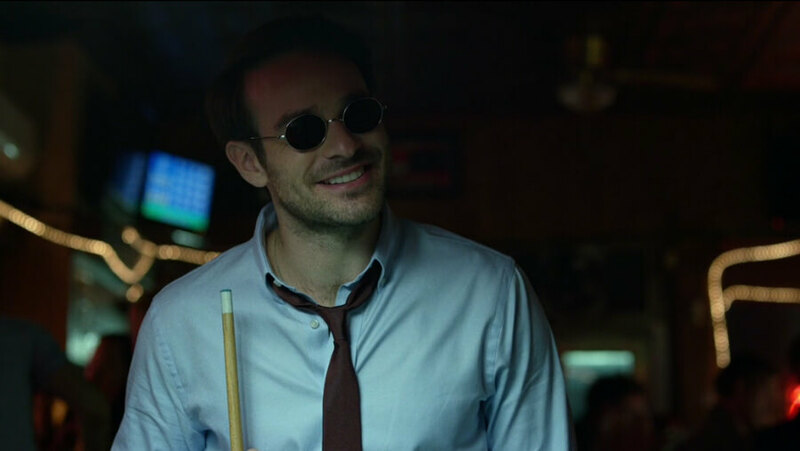 The balance Matt Murdock seems to have achieved over the months that have passed since the end of last season actually seems to rub off on the structure of the first episode itself, which moves seamlessly between the main character’s different domains, and between the main players in the story. “Bang” immediately brings us into the same world we came to know last year, and it’s populated with characters that feel lived in. All the actors just seem much more at home with the characters they’re playing, and even Cox’s accent is better this season. I can’t deny that I enjoyed the scene of the Nelson & Murdock staff hanging out and playing pool at Josie’s, in large part because it didn’t seem to be apologizing for its existence. 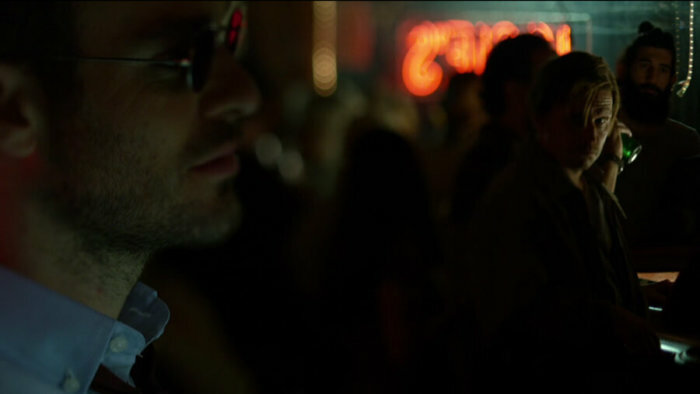 Though the writers give us plenty of tension right off the bat, both between Matt and Foggy – who have at best reached a truce when it comes to Matt’s secret life – and with the mayhem introduced by Frank Castle, they also have the confidence and the knack for writing dialogue that allow for the kind of scene that gives the characters room to just be. When Frank “The Punisher” Castle does arrive on the scene, the writers make sure that it’s as terrifying as it should be. The way he takes out the Irish is one thing – we don’t really care about them, and the shooter is hidden from sight – but the scene with Daredevil lifting a member of the cartel from a hook in a slaughter house is gruesome. By the time we cut to Frank walking down the hall of the hospital, coming after Grotto, the threat is very real. The chase scene is shot perfectly, and it’s hard to not feel the frenzied panic spreading through the hospital. Every character is given something meaningful to do this episode. Karen shows that she’s every bit as cool under pressure as last season, and Foggy demonstrates his own brand of courage when he goes up against the Dogs of Hell. Brett, Hell’s Kitchen’s “one good cop,” is back too, providing as sense of continuity and filling everyone in on what we need to know about Castle going forward. The fact that it’s initially assumed that these shootings are carried out by a group of people says plenty about the kind of adversary Daredevil finds himself up against. I’ve read at least a couple of reviews that have been less than enthusiastic about the first episode, pointing to it as a bit boring. I couldn’t disagree more. This feels like sophisticated storytelling. If it takes at least a little bit of time getting to the action, it’s because it has the confidence to let things progress organically. For me, this episode is evidence of an already “grown-up” show displaying even more signs of maturity and confidence in its own strength, much of which rests on the characters. I honestly couldn’t ask for more. The same subtle effect that appeared last season when Matt is seen listening closely to someone is back this season, and I’m a big fan of it. It really conveys the idea of him focusing on something while everything else fades out a bit. In general, this show is actually pretty good at taking into consideration the fact that attention is a limited neural resource. We all tend to miss many of the things that are outside of our attentional “spotlight” that have nothing to do with an inability, on a purely sensory level, to detect such events. For this episode, there are two scenes that are worth special mention from a sensory perspective. The first is the scene at Josie’s when Matt notices Grotto. Grotto may have actually been sitting there for a while – Matt obviously didn’t notice him come in which makes complete sense in light of what I mentioned above – but at some point, all the signals he’s sending out reach that necessary threshold. There’s the classic heartbeat, the smell associated with him (I can’t swear adrenaline specifically has a scent, but “fear” generally actually does), and the behaviors which can be heard or otherwise sensed. Without going overboard, it’s a well thought out. 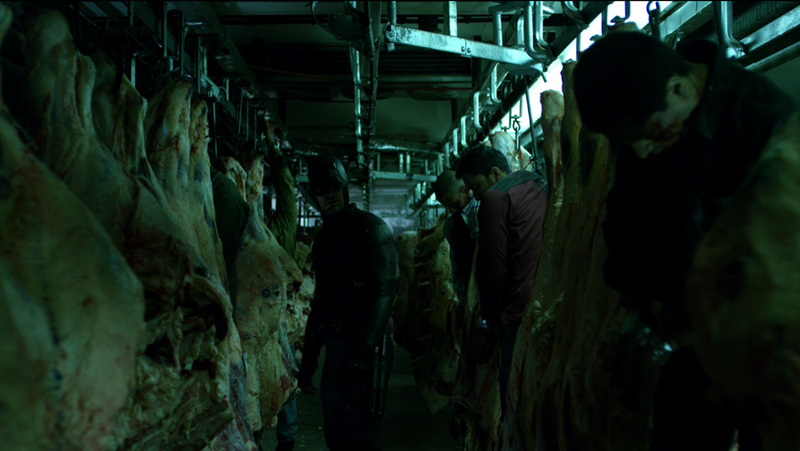 The second scene I wanted to mention is the one when Matt, as Daredevil, finds the bodies in the slaughter house. This is, in many ways, similar to the scene in season one when he finds Madame Gao’s drug operation, and just sort of gradually figures out what’s going on. It’s very easy to write Daredevil as if he’s always walking into a lit room, metaphorically speaking, but I think these scenes where he’s peeling back the layers just make much more sense. Nothing to report, and I’ll probably skip this section altogether for at least most of my reviews this season. I will, however, take the opportunity here to say this: All in all, the respectful and grounded treatment of Matt’s blindness – both the aspects that can be considered part of his “cover” and those that remain despite his heightened senses – continues from last season. As much as I expected the switch to “braille only” going into the first season, it was still a welcome update compared to the comics. There is a crisis in braille literacy happening in the real world, and to see it featured as heavily as it is in this show is welcome move that has the distinct advantage of feeling like a completely natural component of Daredevil’s world. Well, first off there is the moment in the scene of Matt and Foggy walking down the street that I called as a nod to the 2003 Daredevil movie in my previous post. Same thing goes for the fruit and baked goods in the following scene. There’s a Mr. Maxwell among their clients. This could be a coincidence – characters have to have names, sometimes there may be accidental similarities – but it reminded me of two other Marvel Maxwells. There’s Maxwell Dillon, better known as Electro, and Maxwell Glenn, the father of Heather Glenn who was Matt’s girlfriend since just before Frank Miller started writing Daredevil, and until her death by suicide. In these cases Maxwell was/is a first name, but it’s certainly possible that the use of it here wasn’t coincidental. The man who survived the shooting and asks Nelson & Murdock to represent him is named Grotto. This is a name well familiar to longtime Daredevil fans. Just like Turk, with whom he’s often been associated, Grotto is a small time crook in the comics. The scene of Foggy going to talk to the Dogs of Hell is like something straight out of the issue Guts, a Foggy-centric story from the Miller run in which Foggy courageously takes on the underworld while Daredevil secretly follows him around and helps keep him safe. The reference to Guts becomes even more obvious when the biker who takes Foggy outside says: “You’ve got guts, Harvard, I’ll give you that.” To which Foggy replies, “Columbia, actually but it’s not courage, it’s more like sheer adrenaline.” Foggy’s line may actually count as its own Easter egg since Matt and Foggy attended Columbia according to the canon of the main comic book (updated by Frank Miller from Stan Lee’s “State College”), but attended Harvard in the Man Without Fear mini-series (also by Frank Miller, with art by John Romita Jr.). Thus far in the game, Matt. He is able to juggle his friendships, his law practice (though it sadly isn’t making any money), and his Daredevil gig. He even has time to play pool and drink beer. You’d almost think he’s got this vigilante lifestyle figured out. Too bad it can never last. I really liked the playing pool scene. I’d been looking forward to it since they leaked the on set photos months ago, so I’m glad it was in the first episode along with the earlier sidewalk scene where Foggy’s mopping up the blood on Matt’s neck with a handkerchief. Speaking of which, how great is that as a character trait that he carries a cloth hanky? The only thing that bugged me in that section was that while Matt picked up the sound (and smells?) that Grotto was giving off, he failed to notice the smell of blood although Grotto was bleeding enough to pass out. I would have thought that would be more noticeable than the elevated heartbeat in a crowded noisy room. By the way, I was expecting Matt to tell Foggy that he didn’t know it was the eight ball that he’d sunk. He can do the shots but wouldn’t know which ball was which. (Like you I don’t agree with the idea that he can identify colors with his radar sense. With pool balls I doubt feeling them would help either since they’re smooth.) A missed opportunity to clarify his powers a little more. I didn’t love the cliffhanger ending. They seemed to do that a lot this season which I didn’t mind while watching one after the other, but didn’t appreciate when I had to leave for work right after this episode. It made for an interesting day. I was just glad I didn’t have to wait a week or longer until the next episode. Thanks for the review! I also wondered that Matt didn’t noticed that Grotto was wounded and bleeding, and I also questioned what appeared to be a little visual interplay between Matt and Foggy as Grotto was telling his story, in which Foggy was non-verbally asking Matt if Grotto was telling the truth. You’re absolutely right about the blood. I remember thinking that was weird the first time I saw the episode and then somehow thought about it less the second time. 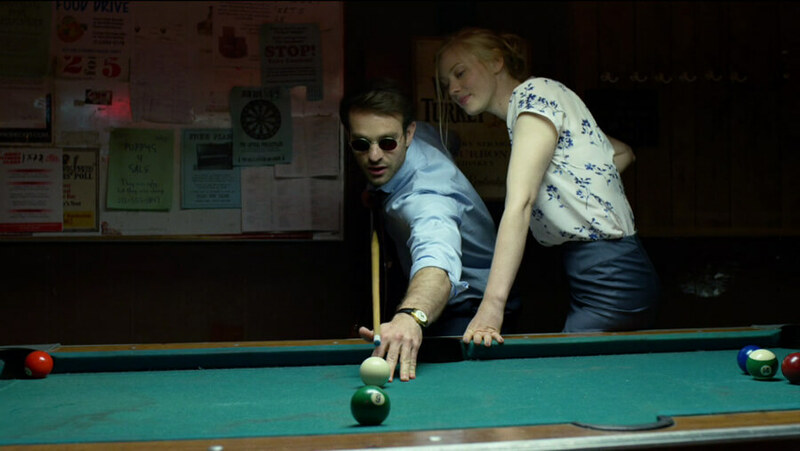 Regarding Matt playing pool, I thought this was just a great way to pay homage to a similar scene in Daredevil: Yellow. Of course, realistically speaking, it would be a challenge to keep track of every single ball as the game progress (and he’d of course have to be told at the beginning which is which). In that sense, I agree that it would have been kind of funny if he told Foggy he didn’t know it was the eight ball. I’m not sure I agree his powers specifically needed clarification here though. He hasn’t been able to identify colors by touch since the early Bronze Age and has never been able to do so using his radar (except in that bizarre, future timeline story by Mark Waid and Javier Rodríguez). For this show, there’s never been any indication that he has any clue about what color is which so I would assume that the vast majority of viewers get that. Still, it might have been funny to turn it into a different kind of joke, I agree. Sensory items: in general, TV/movies don’t do smells well. No doubt that’s in part to it being a highly visual medium, but I think it’s also because our society teaches people to eliminate/ignore smells to the point of oblivion. I think Matt sensing someone has a lot of adrenaline rushing through them is a combination of things – the smell of sweat, elevated heartbeat, alterations in breathing, and in some cases the smell of sexual arousal for those enjoying/getting off on the rush. Him saying “that guy has a lot of adrenaline” is short hand for detailing all of that. I think missing that Grotto is bleeding is an issue, but the smell of blood might well be something commonly present in some environments – any establishment serving meat that starts raw and is cooked on premises is going to have an aroma of blood that Matt can detect even if we can’t (and sometimes we can, but many just don’t like to think about it). There might be other people with injuries at Josie’s. It might be that Matt is aware of the scent to some degree but not focusing on it with the same intensity as he is the fact Grotto has a hand on a gun in his pocket. Then, too, Grotto might not be actively bleeding at first but then moves wrong and breaks open his poorly clotted wound. There are a lot of possible reasons I can think of but – and this is a flaw that crops up several times in season 2 – I shouldn’t have to do the work of picking these things out. It would have made much more narrative sense if, say, Grotto stood up, winced/moved as if in sudden pain, and then collapsed. 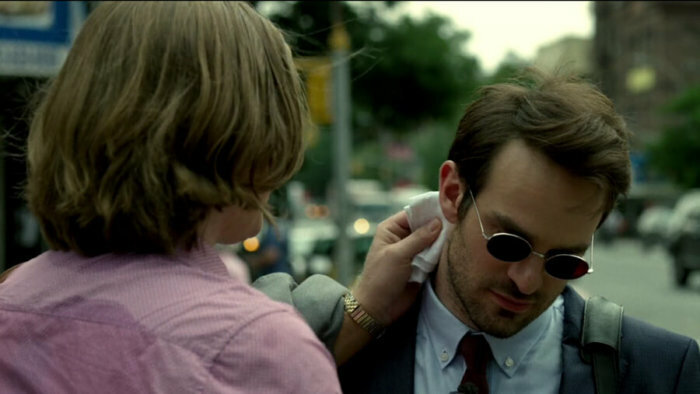 The scene with Brett, where Foggy asks Matt what he picked up “because your hearing is better than mine” shows that while Foggy isn’t comfortable with the Daredevil gig he has become comfortable with his new knowledge of Matt’s sensory enhancements. Foggy if very comfortable with Matt’s sensory differences, casually referring to his blindness and “four working senses” while in no way showing pity and acknowledging where Matt has superior perception. The “it’s weird and invasive” thing seems to have disappeared for Foggy. Foggy can be Matt’s eyes, but Matt can also “lend” Foggy his senses. The pool game: great character moment. A lot of people discuss the Matt+Karen thing like it was Matt’s idea, but really, it was Karen’s – her near-embrace of him while instructing him on taking a shot was clearly a sign she’s interested, and Matt would pick up on her reactions to him (we did, in fact, get a bit of her heartbeat in there). Matt didn’t pursue Karen until he was aware she had some interest in him, first. The bit with Matt sinking two balls was a nice little moment between the two men – Foggy knows damn well Matt can shoot pool balls with uncanny precision, but I agree that Matt should have made a comment about having no idea of the color and numbers of the balls he’s shooting. Matt’s unusual abilities are a secret the two of them share. I’d like to see Foggy eventually reconcile with Matt being Daredevil, rather like the friends and families of police officers, soldiers, and firefighters have to reconcile with the dangerous jobs their loved ones perform. They worry, it’s stressful, but they don’t stop their loved one from doing their job. Something we know that the rest of the Marvel world doesn’t: Foggy knows Matt is a living lie detector, and he also knows that while Matt can’t read subtle facial expressions he can read some body language. Matt knows that Foggy wants to ask him if Grotto is telling the truth, so when Foggy turns his head towards Matt, Matt knows to signal him. This was, actually, obvious to me but I think it’s another instance where things could have been made a bit more plain to the audience. In fact, it would not be out of line for Matt to flat out say “I think he’s telling the truth” without needing to explain why he believes Grotto. Except that Matt and Foggy are platonic life partners and understand each other like some long-married couples, they don’t always need explicit words to communicate with each other. That’s how I took the lie detector thing too. Great review! I like the comparison to Guts, one of my favorite stories from Miller’s run. I think it’s pretty unlikely that that story could happen in this show, so it’s nice to see something like it. I’m just sad that Turk and Grotto aren’t pals in this, which is a shame. Where to start? Love the smile Daredevil flashes in that opening. He likes being Daredevil. Maybe a little too much? Hmmm. Everyone steps right back into their roles and continue to knock it out of the park. I could praise this series all day, but I’m not a fast typist and I’d be repeating the same praise as everyone else. You mention other reviews calling the first episode a bit boring. I’ve seen numerous criticisms of Karen and Matt saying they have no chemistry together. Did these people accidentally watch Arrow instead of Daredevil? Everyone has their opinion, and if someone isn’t necessarily rooting for Matt and Karen to hook up is one thing, but to say they have no chemistry is just not accurate. Its palpable how much heat is between those two. Its absurd how much chemistry Charlie has with everyone on screen, but especially his female cast mates. Hell, for a brief moment last year I was rooting for Matt and Vanessa to start something up. My one complaint, and I’m probably in the minority here at least, is the Dogs of Hell bar scene. I love Foggy. I love Hensen’s portrayal of Foggy. He gets a lot of hate in a lot of other circles, both the actor and the character itself, that I don’t get. That said, he is the weakest actor of the main cast. He’s great, but he is not on the talent level of Cox, Woll, D’onofrio, Bernthal, Yung, or Moore and Hall from season 1. The Dogs of Hell scene illustrates his one weakness I’ve noticed through the series. Hensen can’t do scared or terrified. I was wincing during that scene between Foggy and the biker more than any violent torture scene the series gave us and wishing for it to end as quickly as possible. A similar but much, much shorter moment in season one is at the end of episode 9 when he sees “The devil of Hells Kitchen” in Matt’s apartment. Thats his one big weakness, but he brings it otherwise with the drama, humor, rage, sadness, etc. Just my opinion. 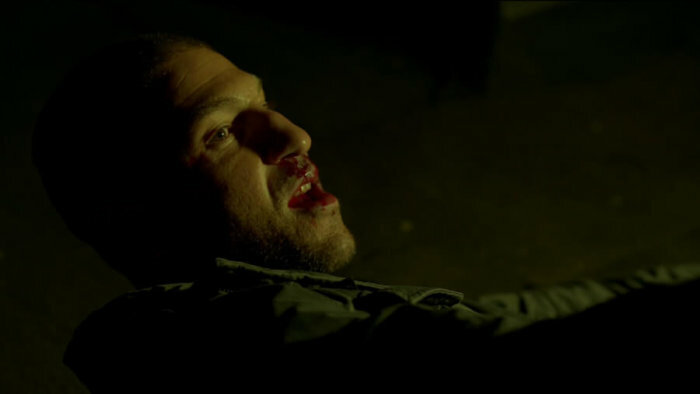 Bernthal owns it from his first moment on screen.